It's a linky party! I love linking up with other bloggers, especially when it might or might not involve shopping! I thought this idea from Teach Speech 365 was so fun. 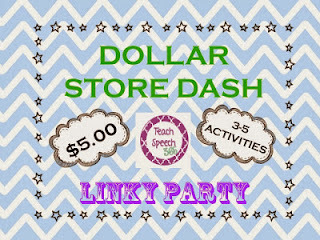 The challenge was to go to the dollar store and spend $5 or less and create 3-5seech or language activities with the items that you purchase. 1) With the mini pumpkin, and decorations, I am going to play a Mr. Potato head requesting game. I will take pictures of each of the face pieces and then use it with my students who have ASD. They can use the pictures to request with PECS, or as visuals to help with verbal requests. E.G., "I want the green mouth." 2) I bought two cardboard doll houses to work on following directions and prepositions. I will set up two of the houses back to back. Students can either play with each other or with me. We will describe where to put everyone, and then see if our houses look the same. E.G., "Put the cat on the purple rug upstairs" or "Put the cat next to the girl." 3) Spooky Articulation! 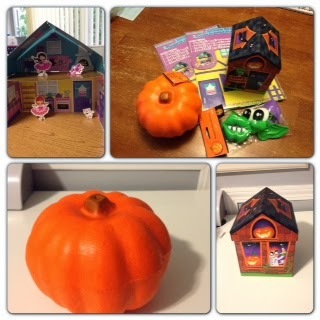 The last activity will use the cardboard Halloween house. I am going to cut a slit in the top of the roof that will fit my articulation cards. Students will take turns saying their words, and then place them in the roof of the house. Simple, but my kids loving putting their cards inside of boxes! Thanks for checking out my dollar store ideas! This is a fun challenge that anyone can take to get a few fun activities at school for a pretty cheap price! Thanks for joining the party!! I love the dollhouse - I don't think I saw that at my Dollar Store!! I just bought the haunted house the other day. They didn't have it the first time I went in, but they seem to be pretty sturdy!